Gold futures edged lower Friday, snapping a five-day winning streak, but still registering an explosive weekly gain of $111.10, or 6.8 percent. Gold prices dipped 50 cents to close Friday at $1,747.20 an ounce in the December futures contract on the Comex in New York. The yellow metal ranged between an intraday low of $1,733.00 and a high at $1,754.00. "We had a really heavy week on the news front with the euro zone and U.S. GDP… the market’s trying to work out where gold should be, wondering if this euro zone package has solved the problem," Reuters quoted Mitsubishi analyst Matthew Turner. "There’s been some euphoria all week, but now some people are saying the details are a bit sketchy. The problem is no one’s quite sure what this means for gold. If it is trading like a risk asset then it should go up if skepticism sets in about the euro zone rescue." Last week gold prices swung through a range difference of $92.10. This week’s range spread was $117.40, with the lowest price hit Monday at $1,636.60 and the top at $1,754.00 with Friday’s aforementioned intraday high. Gold prices are expected to rise next week, according to most participants in the latest gold survey conducted by Kitco News. "In the Kitco News Gold Survey, out of 34 participants, 26 responded this week. Of those 26 participants, 19 see prices up, while 5 see prices down and 2 see prices sideways or unchanged. Market participants include bullion dealers, investment banks, futures traders and technical chart analysts. Mark Leibovit, editor of VRGold Letter, is looking for gains. ‘Gold is correcting its recent decline, now retracing 50% of that decline. Seasonality is wind at the back of the gold market and though we could a trading top in early November, let’s give the upside the benefit of the doubt,’ he said. Others said the temporary fix for Europe’s debt crisis adds a bit of…"
Last week’s Kitco survey had 11 participants correctly forecasting higher gold prices while 10 market watchers had expected them lower. Gold remains the best performing precious metal this year with its overall gain of $325.80, or 22.9 percent. Silver extended its winning streak to six straight days Friday. Trading between $34.715 and $35.700, silver prices for December delivery rose 17.6 cents, or 0.5 percent, to settle at $35.288 an ounce. The white metal surged $4.10, or 13.1 percent, this week, accounting for most of its 2011 pick-up of $4.35, or 14.1 percent. Platinum is also riding a wave of six consecutive daily gains. 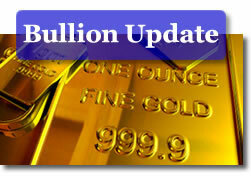 Platinum prices for January delivery advanced $10.40, or 0.6 percent, to close at $1,651.80 an ounce. The PGM metal ranged from $1,628.60 to $1,661.80. For the week, platinum advanced $142.60, or 9.4 percent. Like gold, palladium edged slightly lower Friday. Palladium prices for December delivery settled at $668.35 an ounce for a loss of $1.55, or 0.2 percent. Prices moved between an intraday low of $651.00 and a high of $675.00. While down for the day, palladium was higher on the week by $50.10, or 8.1 percent. Despite their sharp weekly increases, platinum and palladium remain lower on the year. Platinum has retreated $126.40, or 7.1 percent, and palladium has declined $135.15, or 16.8 percent. London precious metals scored weekly gains with advances of 6.0 percent for gold, 15.0 percent for silver, 7.9 percent for platinum and 7.0 percent for palladium. While weekly sales rose across each of the United States Mint’s American Eagle bullion coins — something that does not happen often outside the first week of a month, the levels were weaker for the major one-ounce sizes. *The as of date for sales of U.S. Mint America the Beautiful Five Ounce Silver Bullion Coins is Tuesday, October 25, 2011. The Mint does not publish daily sales for its 5-ounce coins.